I am pleased to announce the availability of the link checker function in LibGuides. The system will check for broken links inside LibGuides boxes (for all boxes except the rich text box type) twice a month and produce the report which will enable you to fix these broken links easily. The function is available on the main admin screen, please see the screenshot below. As always, your feedback and suggestions are always appreciated so try out the link checker and let us know what you think. Thanks to the (awesome) feedback and ideas from our client libraries LibGuides is getting better all the time. The latest round of feedback/ideas resulted in the 4 new features we just released. The new look for the Community Site (http://community.libguides.com), with cleaner interface and the ability to browse guides by Subject. See more in-depth description of the new community site at the end of this post. Improved “Browse All Guides” page for individual LibGuides sites, giving users the ability to browse/list of guides at your institution sorted by Title, by Subject, and by Author. For example check out the new browse all guides page on our demo site – http://demo.libguides.com/browse.php. The new API function for generating the list of Subjects for your LibGuides site. This new API function is available under the “Widgets & API” tab on the main admin screen. With this new API function you can embed the list of your LibGuides subjects into any other webpage outside of LibGuides. LibX search integration with LibGuides search. This is really cool – LibX is a popular open-source library search browser toolbar and now you can search your LibGuides content via LibX. 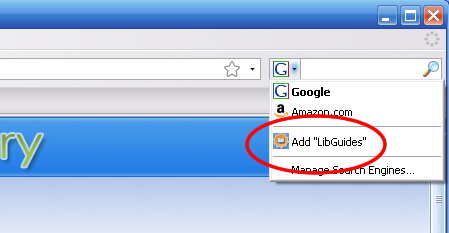 We have worked with LibX developers to make LibGuides full text search available thru LibX. A separate post on how to configure LibX toolbar to search is coming later today. You will notice a new look with the tabbed interface when you go to http://community.libguides.com. The new site makes it easier to find interesting guides and look for ideas for creating new guides for your particular subject speciality. Simply click on “Explore Guides” tab and select “Guides by Subject” (here is the direct link – http://community.libguides.com/community.php?m=g&s=all). We also aggregated the list of all our client libraries, together with the google maps mashup showing all of them on the world map, into the “Browse Institutions” tab (http://community.libguides.com/community.php?m=i). We are planning further improvements to the Community Site, so please let us know what else you’d like to see there. Here are the most recent cummulative stats for the LibGuides community; over 20,000 content pages were added last month!